Happy St. Patrick’s Day everyone. Yay. That’s why I don’t live in Maine!!! I want my barefoot weather back, please and thank you. Lol. To be fair..that’s why I don’t live in Maine anymore either!!! They just got two feet of snow and I can see the grass in my yard. I win!!! What’s all the fussin’ aboot? It’s a fine, Canadian, summer day, eh? Sometimes a little crazy is all it takes to scare the hell out of the neighbors… 🙂 Thanks for visiting! 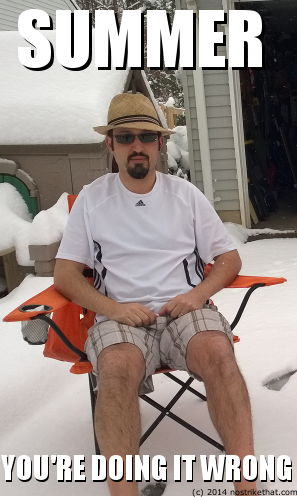 LOL So glad to live in the south in shorts and flip-flops on 3/17. Sorry to rub it in. Cheers!